Renuka Sahu, the woman sarpanch of Gram Panchayat of Kumhi village of Fingeshwar Development Block in Gariyaband district did something that has set an example in the entire district. She has given a wonderful gift to the villagers by making a garden in the five acres of the village. Now the villagers are enjoying the pure environment, fresh air and the quiet surroundings. Not only the residents of Kumhi village, but also people from the neighboring villages come for a walk in this lush green and serene garden. This positive approach of the Sarpanch of the Gram Panchayat was also supported by the panchayat representatives and the proposal was almost instantly and unanimously passed and the plan to develop the garden was soon materialised in a very short span of time. There was a severe threat of encroachment on this land of the village. This garden, developed in 5 acres of area on the Bakhli road, has come out beautifully and is maintained extremely well by the organisers and the administrators. This garden attracts the attention of the passers-by and they are tempted to step into this amazing garden for a stroll. 5 HP motor pumps and pipelines have been installed for irrigation in this garden to water the fruit bearing, floral and ornamental plants. A large terrace has been built, where comfortable seating has been arranged for. The drainage of water through the pucca drain has been ensured on both sides of the garden. The convergence of governance plans has also been done in an extremely efficient manner for the development of the garden. In the center of the Garden, a big pond has been constructed by MNREGA, which is useful for water conservation and drainage of water. The boundary wall of the garden is decorated with attractive paintings and beautiful drawings. During night time, the LED lights placed in the garden, illuminates the entire garden, which makes it look even more beautiful. Observing the garden in the past few days, collector Shyam Dhavde says that the garden has evolved in Village Kumhi, which is the result of good thinking of the Panchayat. This is the first village in the district, where a beautiful garden has been built over a 5 acres land. Kumbh Nagri Regime is changing the picture of a village with two thousand people located just four kilometers from it. Villagers are also happy with this facility in their village. 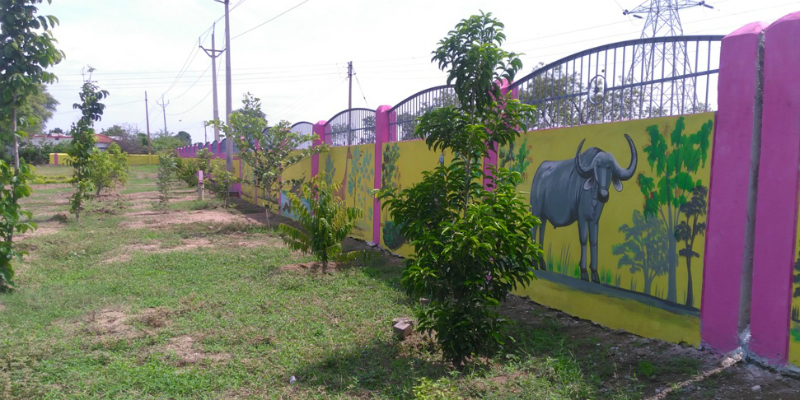 Sarpanch, Renuka Sahu says that while building this garden, they were helped at district level, by the Panchayat representatives and also by the villagers. All this together, made the garden a possibility. Sarvam Sahu of the village says that children, old and young people are also enjoying the garden. Harishankar, a local youth said that he visits the garden every day in order to stroll there with his friends. The quiet and silent environment also helps in preparing for studies and career. The garden fills the mind with calmness and a sense of tranquility and it has become a boon for the people of the entire area.